Aquillius Aeresius is an Imperial citizen living in Solitude with Vittoria Vici. He will take over the East Empire Company building where Vittoria Vici works if she is killed. 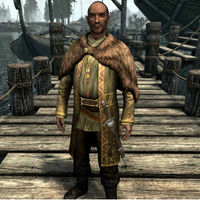 He may also appear at the Thalmor party during Diplomatic Immunity. At 8am, he heads down to the Solitude docks and wanders around there. He goes to sleep at midnight. Aquillius wears a set of fine clothes and fine boots. He carries a steel dagger and the key to Vittoria Vici's House. If talked to, he will say either "Good business for the East Empire Company means all the more gold for the Empire." or "I don't have time for anyone too lazy or cowardly to make their own way in this world." He shares these two dialogue lines with Vittoria Vici. This page was last modified on 5 November 2016, at 23:06.